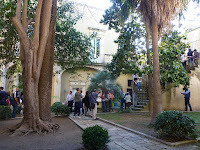 The Lecce Italian Language Experience: September filling fast. Now from $AUD5990* twin share. September filling fast. Now from $AUD5990* twin share. Only a few places remain on the September 2017 Lecce Italian Language Experience. It will be full by the end of February. Now from $AUD5990* twin share. Book now to avoid disappointment. The price includes airfares, accommodation, tuition fees, day trips, cooking classes and more. Just open the following link for all you need to know. As always, enquiries from people outside Australia are most welcome with prices adjusted according to your local currency and circumstances.